Les Chutes du Carbet in southern Basse-Terre, Guadeloupe are the Caribbean's highest waterfalls. Pointe-à-Pitre, the island's main city is located on the on eastern butterfly wing of Grande-Terre and can be interesting to explore on foot . Among the most popular attractions are the open-air and covered marketplaces just a couple of streets from the harbor front. They are worth a visit not only for their multicolored and many-scented treasures, but also because of the animated exchanges of the locals. By contrast, jewelry and French high fashion are available in abundance along the narrow, bustling streets of the city. On the Rue Peynier behind the St. Antoine Market, is the Musée Schoelcher, dedicated to Victor Schoelcher, the man credited with helping abolish slavery. Not far away, on the Rue René-Boisneuf, a plaque marks No. 54 as the birthplace of Nobel Prize-winning poet St. John Perse. Nearby, the Musée Saint-John Perse is housed in a handsome, historic, much-photographed building, located on the corner of Rues A.R. Boisneuf and Nozières. The modern Centre Saint-John Perse, a beautifully designed commercial complex on the city's harbor front, has a hotel, boutiques, shops and restaurants. Easily accessible to cruise passengers, it is conveniently located for other visitors as well. Place de la Victoire remains a cool oasis in the bustle of Pointe-à-Pitre. In addition to royal palms, there are majestic shade trees called sabliers, as well as Gabon tulip trees and royal poincianas. Bordering the Place are houses mostly made of wood with attractive open-air balconies. These buildings, dating from the island's colonial past, lend a stylish, old world atmosphere to this part of town. Not far from here is the 19th-century Cathédrale de St. Pierre et St. Paul, nicknamed the ''Iron Cathedral" because of its skeleton of bolted iron ribs, designed to keep the church standing through hurricanes and earthquakes. In the opposite direction, away from the port, is a new area of startling modern architecture. Grande-Terre offers an abundance of beautiful beaches and many fascinating sights. Leaving Pointe-à-Pitre on the "Riviera" road that leads to many of the island's tourist hotels, the first area of interest is Bas-du-Fort. It has a large, handsome marina for boats and yachts and the historic Fort Fleur d'Epée. Next, just off the main highway, is the newly refurbished Guadeloupe Aquarium, which ranks as number four in all of France. Gosier, with its convenient central location, is the major resort area of the island. Continuing east, past charming Ste. Anne and the resorts of St. François, one comes to the rocky formations of Pointe des Châteaux, a most surprising landscape for the Caribbean, resembling Land's End or Finistère in Europe. In the distance is La Désirade island. Continuing on around the coast, the road passes a stately colonial Maison Zevallos and goes through Le Moule, formerly the capital of Guadeloupe. Here, the handsome Musée Edgar Clerc, is a gem both architecturally and historically. Further north is the Porte d'Enfer (Gate of Hell), a jagged coast with a magnificent view; and finally La Pointe de la Grande Vigie overlooks a stunning scene of stark white cliffs rising abruptly from the ocean. Returning to Pointe-a-Pitre, one passes through the towns of Port Louis, Petit-Canal and Morne-a-l'Eau. The latter is known for its very large cemetery, with 000000 and white tile, aboveground crypts, resembles a miniature city. On the night of All Saints (November 1), the amphitheater-shaped cemetery is ablaze with thousands of candles. Please click here for a directory of sightseeing and excursion resources. Guadeloupe's western ''butterfly wing" is Basse-Terre. After crossing the Pont de la Gabare bridge over the Rivière Salée, one has the choice of going either north or south along the coast, or straight into the National Park, an ecological wonderland covering one-fifth of Guadeloupe's total terrain. 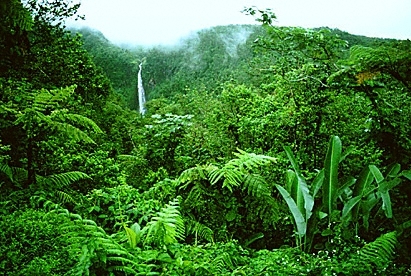 Those going directly to the Park will encounter a lush rain forest and enjoy such sites as the Cascade Ecrévisses, a sparkling waterfall and pond, the Parc Bras David, for good walking tours of varying lengths, and the Parc Zoologique et Botanique, an interesting zoo and botanical garden. For travelers following the northern route, a first stop could be the Compagnie Fermière de Grosse Montagne, a working sugar factory that is itself a work of art. The refinery was recently revamped, its gigantic machinery repainted in a rainbow of vibrant colors, resembling a Guadeloupean version of Paris' Centre Georges Pompidou. Further west, just before Ste. Rose, is the Musée du Rhum, which traces the island's proud history as a rum producer. The museum has explanatory texts in English. A free dégustation (tasting) is included in the entrance fee . Turning south along the leeward coast, one finds miles and miles of beautiful stretches of sand, topped off by the popular Deshaies Beach. Underwater enthusiasts will want to stop at Malendure Beach, for a trip by glass bottom boat to its offshore Pigeon Island and Cousteau Reserve, one of the best dive spots in the world. South of here at Vieux-Habitants is one of Guadeloupe's oldest churches, and still further south one encounters the capital city of Basse-Terre, its historic fortification dating from 1643. Formerly called Fort St. Charles, in 1990 it was renamed Fort Delgrès commemorating Louis Delgrès, whose death in 1802 made him an early hero in the movement for abolition of slavery. Other sights in the city of Basse-Terre include a colorful outdoor market and three imposing monuments: the Prefecture, Conseil Général, and Palais de Justice, all majestic reminders of the island's colonial past. From Basse-Terre city there are wonderful views of the impressive dormant volcano, La Soufrière, seven and a half miles away. Motorcoaches take visitors through the lovely suburb of Saint Claude almost to the top of the mountain. You can hike (take a jacket, it can be chilly) to the very summit (1444 m /4,813 ft) to see the amazing fumaroles and wisps of sulfur vapor (they can also be seen from the parking area at Savane à Mulets). Recommended on an excursion to La Soufrière is a visit to the museum at the lookout point, which describes the arc of volcanoes that formed the Lesser Antilles. Heading further south, be sure to stop at the Centre de Broderie, or lace-making center in Vieux-Fort. Hundreds of intricate handmade designs are on display and for sale. From here, it's on to Trois Rivières and the lush grounds of the famous Parc des Roches Gravées, with its rock engravings of animal and human figures by the pre-Columbian Arawak Indians, most likely done between 300 and 400 A.D. From Trois Rivières, you can also catch a ferry to the nearby islands of Les Saintes. At Bananier, stop to enjoy the view of the offshore islands of Les Saintes. A detour to the west brings you to the trails leading to the three magnificent Chutes du Carbet (the Caribbean's highest waterfalls) and the Grand Etang (Grand Pond). Returning to Pointe-à-Pitre via Basse-Terre's eastern coast, you'll drive through the famous Allée Dumanior, a dramatic stretch of road lined with century-old royal palms. Popular stops along this coast are the Hindu Temple at Changy and Ste. Marie where Columbus landed (a monument commemorates the event). Just before reaching Grande-Terre, a stop should be made at the lush Domaine de Valombreuse, a six-acre floral park located just outside Petit-Bourg and featuring over 100 varieties of tropical plants and flowers.